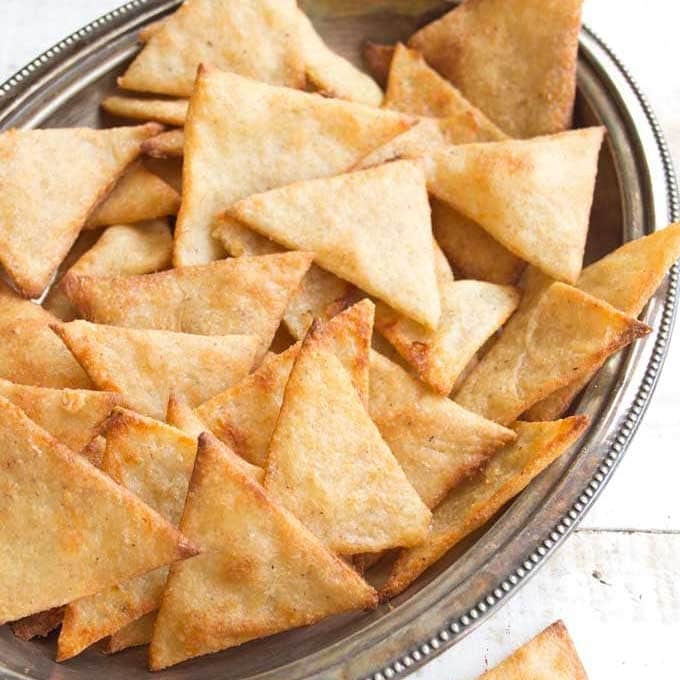 These coconut flour crackers have been a staple in out kitchen for several years. 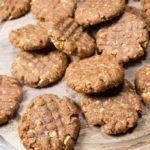 Actually, it’s one of the first Keto crackers recipe I created when I started eating sugar free and low carb. We’ve served it at dinner parties and I’ve even made it at a yoga retreat where I was cheffing and it always gets the thumbs up. Friends, EVERYONE likes cheesy crackers! Most low carb crackers recipes are made with almond flour, like these equally yummy almond low carb crackers. 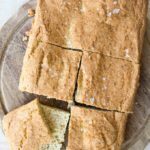 Some people cannot tolerate almond flour though, so these coconut flour crackers are the perfect alternative! Coconut flour is, of course, astonishingly good for you. 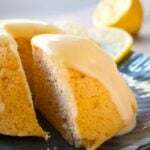 Read more about the health benefits of coconut flour here. The only thing is that it DOES have a gentle coconut taste, which is why it’s a favourite for sweet recipes. I can assure you that this Keto crackers recipe does not taste of coconut AT ALL. How? Well, this recipe contains a fair amount of cheese – a mix of cheddar and parmesan. Combined with the thyme, these flavours are so prominent you’ll have NO IDEA there’s even a sliver of coconut flour in these crackers! 1.) 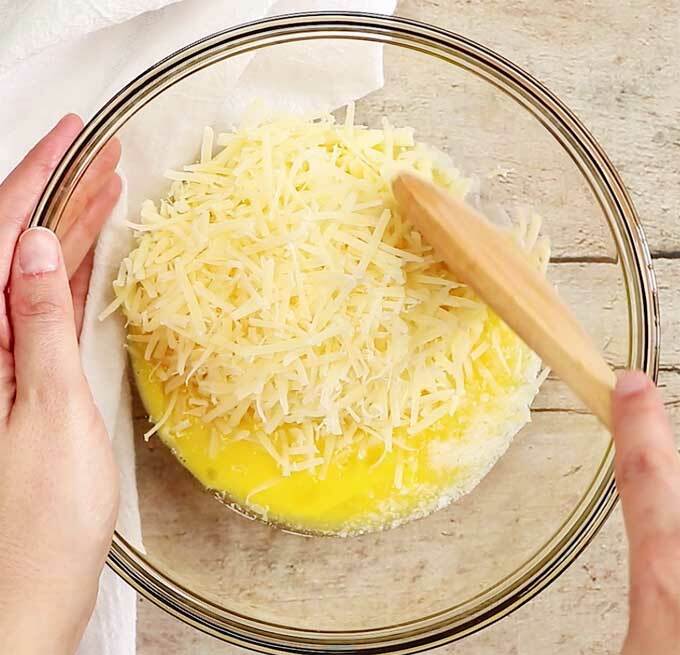 Combine the coconut flour, butter, egg, cheddar and parmesan in a bowl and mix until you have a smooth dough. 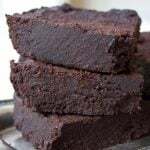 You can do this by hand or with an electric mixer / food processor. Let the mixture rest for a few minutes so the coconut flour can absorb the moisture. 2.) 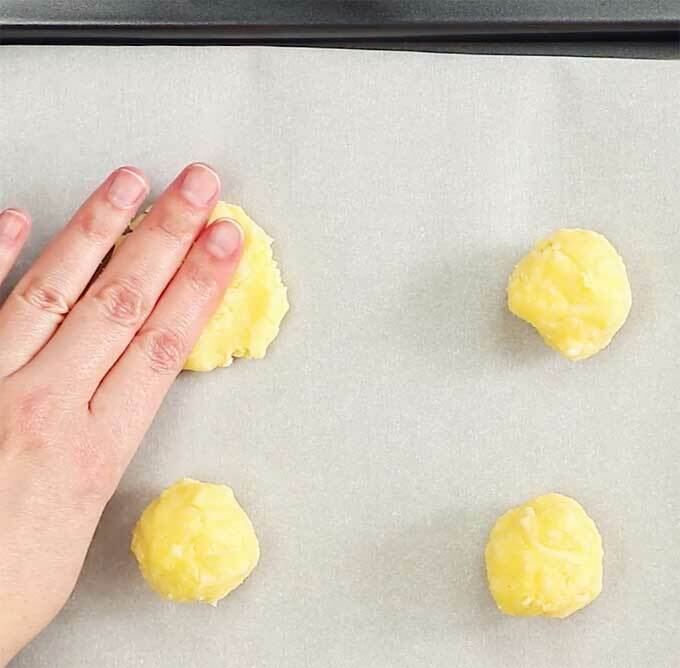 Form 8 balls and press them down on a baking sheet lined with parchment paper. 3.) Top with the remaining 1/4 cup of grated cheddar and fresh thyme leaves. Bake for 12-15 minutes until the low carb crackers are nicely browned and the cheese has melted and crisped up. That’s it! Make sure you flatten your crackers properly. The flatter they are, the crispier they will become. You don’t need to use fresh thyme (although it tastes divine). If you have dried thyme in your kitchen cupboard that will do nicely too. Feel like tweaking the recipe? Try using different spices such as rosemary or make spicy Keto crackers by adding paprika and a pinch of chilli or cayenne pepper. You can sub the parmesan for pecorino if you prefer, it gives a saltier, very tasty touch to the recipe. 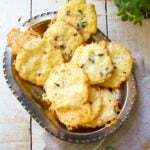 If you are NOT after a crispy texture, you could adapt this recipe and make Keto cheesy biscuits instead. Simply add 1 tsp of baking powder and form 4 larger biscuit shapes instead of the 8 crackers. They will be soft and fluffy on the inside! STAY IN TOUCH on FACEBOOK, PINTEREST and INSTAGRAM for more great food and join my NEWSLETTER for the latest updates. Bookmark this recipe for cheesy coconut flour crackers! They're easy, crunchy and come together in no time at all. Plenty of recipe variations in the post! Mix the coconut flour, melted butter, egg and 1/4 cup of the grated cheddar plus the 1/4 cup of grated parmesan until well combined. You can do this by hand or with an electric mixer / food processor. Let the mix rest a few minutes so the coconut flour can absorb the liquid. Form 8 balls and place them on a baking sheet lined with baking paper. 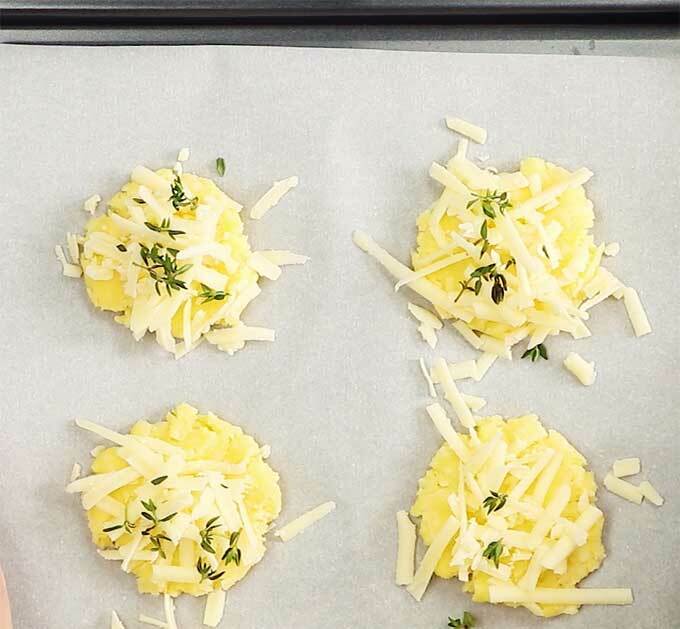 Press them with your hands into little flat discs and sprinkle the remaining cheddar on top. Decorate with thyme leaves or dried thyme. Bake for ca 12-15 minutes until the edges are nicely browned. For a variation, leave out the thyme and add paprika, cumin or even a hint of cayenne. The flatter you make your crackers, the crunchier they will be! This post was first published in September 2016. 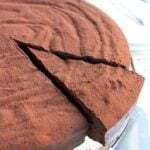 It was updated with new recipe tips and details in March 2019. I just made a double batch and they were PERFECT! 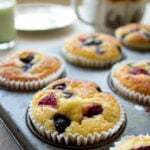 Delicious, easy to make and a great way to use coconut flour. These cheese crackers are so versatile and easy to make. Since I gave up eating processed foods, they’ve been life saviours. Great with any toppings. I love to make mini pizza chips using cheese as a base. they are amazing. Have you tried them? Fantastic! Thanks for the great recipe! These look wonderful. Like your recipes and blog. would be very grateful if you included usa temperatures etc. I just made them..next time, I will put more thyme and make them smaller..mine were chewy..Delish but not a cracker..although they are almost gone! These look so delicious! I would also need to use almond flour. Have you had the chance to experiment with it yet? 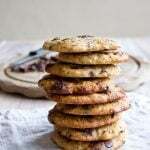 Any possibility that almond flour could be used instead of coconut flour? Of course, you could try that. Though you would have to adjust the quantity and use a bit more. Coconut flour is more absorbent than almond flour. Thank you for posting this option. 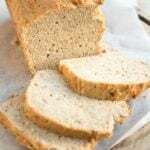 We, too, need to use almond flour instead of coconut flour since my husband has diabetes II. How much more almond flour would we use than the coconut flour? Anything else like baking powder to make it more similar? 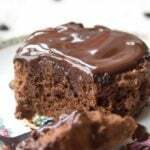 THANK YOU SO MUCH FOR THESE RECIPES – YOU REALLY ARE HELPING ALOT OF PEOPLE. I’d have to try it our myself to be sure. Definitely more almond flour than coconut flour – possibly twice as much. Maybe that’s a good starting point. I’ll experiment with this one as well and will let you know. It’s always good to have alternatives. Some people are coconut flour lovers, some prefer almond flour. 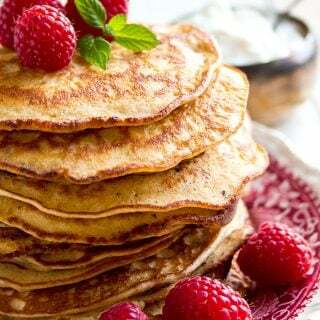 these look lovely and so delish! How many crackers per serving? From the nutrition chart it looks like it might be 1? I am diabetic and have to watch the carbs closely. Hi Jackie, I calculated per cracker. Do make sure to run the numbers on your end as well though. I used the nutritional calculator on caloriecount.com (which is shutting down this month), which is quite accurate, but as a diabetic you need to be 100% sure where you’re at. Hi Sarah, I hope they turn out the way you want to next time. Maybe they just needed a bit longer in the oven? Both cheddar and parmesan crisp up quite well. Fingers crossed! Anybody know the F conversion for 180C ??? How do u think they would be with fresh basil? Have a little pot of it growing indoors. I would imagine it’s really nice with basil. Try it out and let me know! Hi Sara, I have never tried it, but think it should be no problem to freeze them. I often freeze cheese and it works well. Very true. Next time I’ll make a big batch and keep some for a few days to see what happens. Happy Christmas! Those are fantastic Katrin!We’d love to try them with a red pepper spread, and we’d love to see how they taste with kaseri as well (as an alternative to cheddar)!Exceptional work! Thank you! They would be lovely with red pepper. What a good idea. Hi Randi, the nutrition chart is for 1 cracker. Just made them and they are soooo good! These look great! I love cheesy crackers! These look so delicious! And easy to make t0o. I’ll have to give a try! Me too. I also have a huge rosemary bush. Hmmmm rosemary would be good too! Using rosemary sounds lovely. How handy to have a bush in the garden! These look fantastic, Katrin! 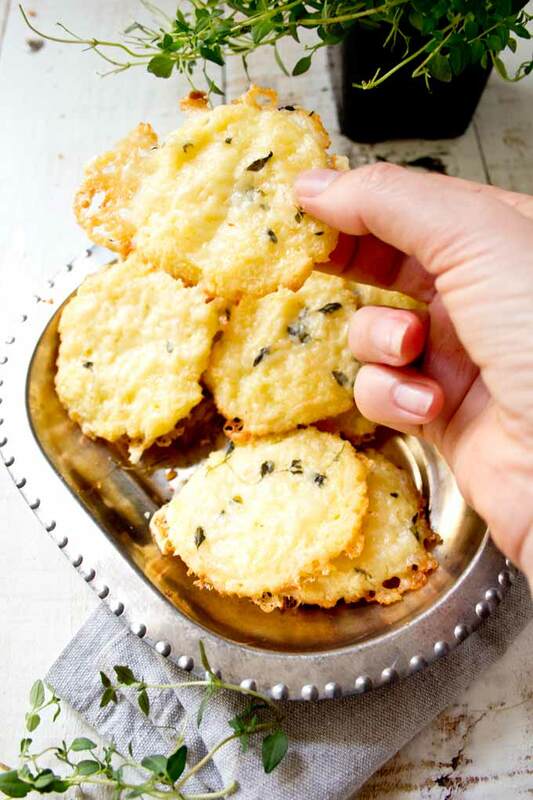 I love to make simple cheddar crisps – the coconut flour and thyme take it to a whole new level! Thank you! 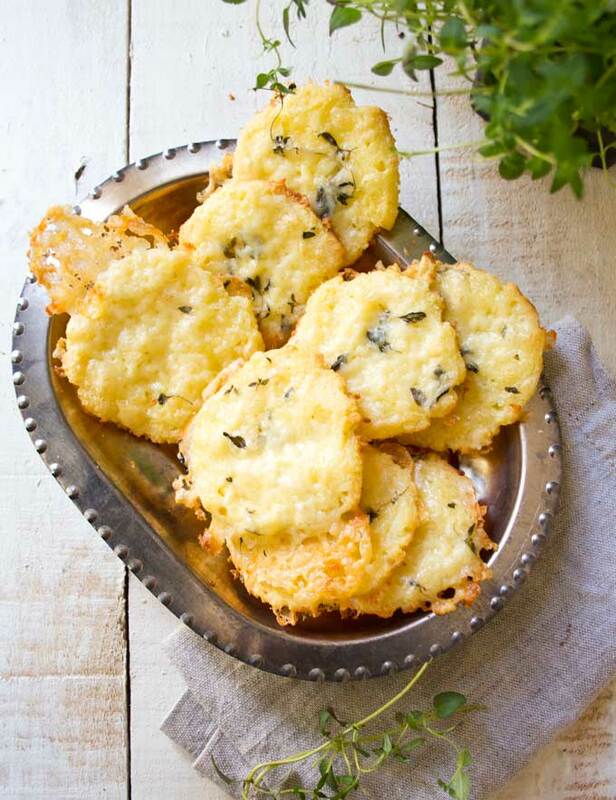 Cheddar or parmesan melted on their own are so moreish… they are a perfect instant snack! 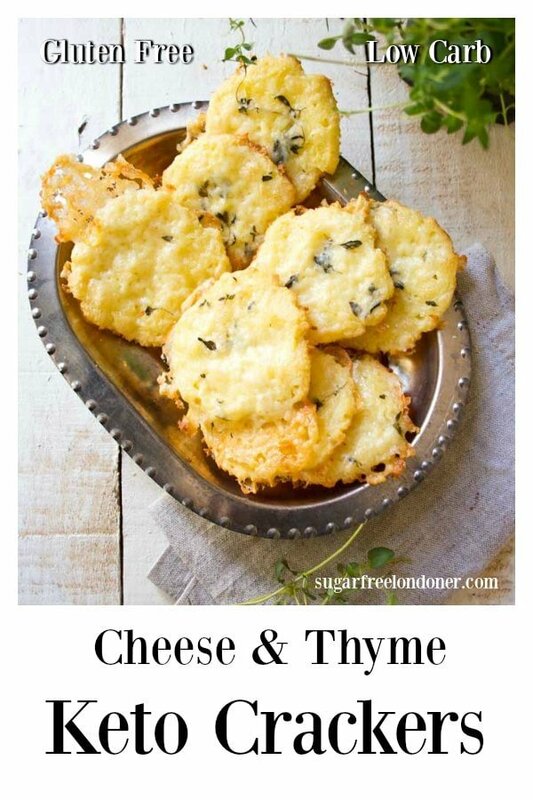 The thyme is a lovely addition to the basic cheese crisps! You can really taste the thmye in these crackers – fresh is best but you could also use dried. I think anything with good English cheddar and savory thyme is delicious. These crackers sound perfect. Thanks for sharing. You are absolutely right there! Hope you try them! These look and sound so amazing-can’t wait to try this recipe out! Brilliant, Deborah! I hope you like them as much as we did! These look so cheesy and yummy!! You could try using a olive oil? A mild one that is not overpowering. May I suggest virgin coconut oil? You are right, there is a great difference in quality when it comes to coconut oil.